According to Darrell Survey, for the third time this season, Titleist achieved the feat of sweeping every major equipment category at a PGA TOUR event - this time it is The Honda Classic - and by looking at the counts, the choice is overwhelmingly clear. From golf balls, to drivers, fairway and hybrids, and irons to wedges and putters, the Titleist brand is the overwhelming field favorite as the Tour moves from the west coast to the Florida swing. > Titleist is the top choice in golf balls with 112 players in the field of 144 - that's 78 percent of the field and seven times the nearest competitor with 16. > One out of every three drivers in the field is a Titleist with 48 (33%) in play this week - that's 16 more than the nearest competitor with 32. > The Titleist TS3 continues to be the most played single driver model on the PGA TOUR with 29, nearly double the next closest driver model with 15. > The Titleist TS3 is also the most played driver on the European Tour again this week with 29. That's 20 percent of the field playing that single model. > Titleist irons also accounted for nearly one-third of the field with 46 (32%) sets in play - 21 more sets than the nearest competitor. > The Titleist 718 MB (20) and the 718 AP2 (14) are the top two most played iron models this week. > Titleist Brand Ambassador Peter Malnati is playing the 718 AP2 Black irons (5-9) that were recently released. Malnati was shipped the irons to his home in Tennessee during his off week but never got a chance to practice with them because of inclement weather. It was the only set he brought with him to the Honda Classic and worked them into his bag this bag this week. He joins Cam Smith as the two Titleist players putting the new AP2 Black models in play. > More than half of all wedges in the field this week (220/55%) are of the Vokey Design variety. The nearest competitor has 60 wedges in play. > Scotty Cameron putters are the overwhelming field favorite this week with 54 (38%) in play, 14 more than the nearest competitor. > More players on the PGA TOUR rely upon Scotty Cameron putters than any other brand and tops the Tour in wins with 4 this season. Gotta love Titleist- their products just deliver! I knew there was a reason my entire bag was Titleist. And to think that everyone of us who plays a piece of Titleist equipment is paying for all that while the guys playing all that aren’t paying anything at all. This is kinda surprising to me. Seems like Taylormade has really lost a step as of late. And titleist isn’t making as big of a deal leading the field as Taylormade has in the past. TaylorMade stopped the pay to play last year but they still have a bunch of guy playing their drivers and putters. Callaway and Titleist have been exchanging almost every week. There’s also several big names not playing this week that are TM staff. I think with the new schedule and guys taking weeks off they normally don’t these stats will be interesting to see over the course of the year. BTW this just show how it’s different strokes for different folks. 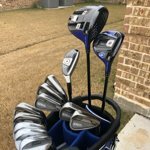 I had my clubs stolen once and we had the head pro at a club as a church member. He vowed to take care of me. He carried Titleist/Cobra and Ping. I could not find a Titleist iron that I liked and much to his chagrin ended up with Cobra. Was ready to throw his entire set of demo Vokey’s in the trash and ended up with a Ping iteration. The only Titleist that ended up in my bag was fairway and the Pro VI. Since then I’ve tried vokeys a number of times and definitely can throw them farther and straighter with a tighter dispersion pattern than I can hit them. But my swing likes Titleist woods and hybrids even though not currently playing them. it is funny that way Rev. I have a good friend locally who is a good player like you around a 3 to 5 index. He swears to me he's not "good enough" to play Titleist. I laugh at him every time he says that, as he plays PING I200 irons. The only Titleist clubs he finally relented to were the 818 H2 hybrids. But he accounts for those being hybrids and being able to hit them. He could easily hit the heck out of an AP3 or AP2 even, but it's just a mental ting with him. He's only played Ping drivers, although he has messed around with a few driers, I've owned, he loves his PINGs. For very good reason though. Haven’t gamed a titleist club since my first (or maybe second) set of irons with the zblend irons. Really intrigued by the new fairway woods and hybrids though. How many of these clubs are played by guys who are under contract? How much do these contracts add up to? Maybe I just miss it, but I don't see much for ads for Titleist clubs on TV. Most of theirs seem to be for the ProV's. I'm not implying that they don't make quality clubs. I'm just thinking that there must be a cost to dominate the club count like this so often. They obviously feel that this is money well spent where Callaway chooses to put an ad on every 3 minutes for "ArtificialJailBreakFace". Is their budget for pay to play any bigger than Callaways ads? Heck, Callaway seems to sponsor every segment of PGA Tour Radio on Sirius that I catch. I think if you take out the Callaway pitches from Hank Haney's content and you have nothing left but Voodoo Cream and whining about the USGA. Are any but the biggest names pulling in mega bucks to play Titleist? What would a mega contract look like? This week will be an interesting one for equipment count IMO. Any chance we could get a run down? FAIRHAVEN, Mass. (Jan. 28, 2019) – Titleist, Golf’s Symbol of Excellence, introduces five new golf bag models across two distinct categories – stand and hybrid – for the 2019 season. TITLEIST PLAYERS COLLECTION: The Titleist Players Collection stand bags – Players 4 StaDry, Players 4 Plus and Players 4 – offer feature-rich designs for dedicated golfers seeking a lightweight stand bag without sacrificing storage or durability. The Players 4 StaDry is the ultimate performance option for golfers that walk in all weather conditions. Fourteen percent lighter than the prior generation model, Players 4 StaDry offers the same lightweight construction and features as the Players 4 – including a 25 percent increase in strap padding for more comfort while carrying – but with premium waterproof materials and seam-sealed protection. The Players 4 Plus is designed for golfers seeking the versatility and comfort of a lightweight stand bag but with extra storage options. To commemorate the launch, the Players 4 Plus will be on display this week on the PGA Tour, carried by the caddies of Titleist brand ambassadors competing in the Waste Management Phoenix Open. The black, white and red bag model is one of 13 colorways in the Players 4 Plus line. TITLEIST HYBRID COLLECTION: The new Titleist Hybrid Collection bags are distinctly designed for golfers who like to walk and ride, offering the perfect blend of premium cart and stand bag features. The two new models – Hybrid 14 and Hybrid 5 – combine the versatility of a Titleist stand bag with an added cart strap loop that allows access to the valuables pocket when strapped into the cart. The Hybrid 14, with 14 full-length club dividers, provides superior organization with maximum storage, while the Hybrid 5 offers a more lightweight, cart-friendly design. AVAILABILITY: The new Titleist Players and Hybrid Collection golf bags will be available in golf shops beginning Feb. 1, 2019, starting at $200. Customization is available on all bag models.